A crown is a covering that goes over the entire exterior of your tooth. It can be made of materials such as porcelain, metals, or porcelain-fused to metal, and it is customized to match the colour of your other teeth. Crowns can restore broken teeth, stained teeth, teeth with large fillings, teeth that have had root canals, and more. A bridge can replace one or multiple missing teeth. It includes one or more artificial teeth that fill the gaps in your smile. The bridge is securely held into place because it is attached to healthy teeth that are adjacent to the gaps. 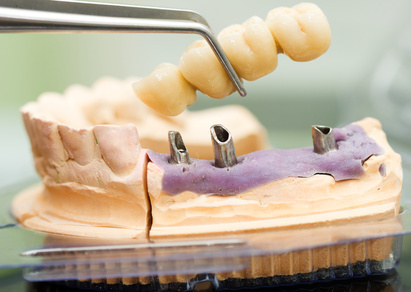 With a bridge in place, you not only improve the appearance of your smile, but you also prevent your other teeth from shifting out of place due to gaps. Bridges, which are usually made of porcelain or gold, are permanent dental fixtures.